Abbie Speer is the co-owner and head operator of Spokes Mobile Canning. It's 8 am on a Wednesday, and already Abbie Speer is well into her workday, nestled between fermentors in the back of No-Li Brewhouse. 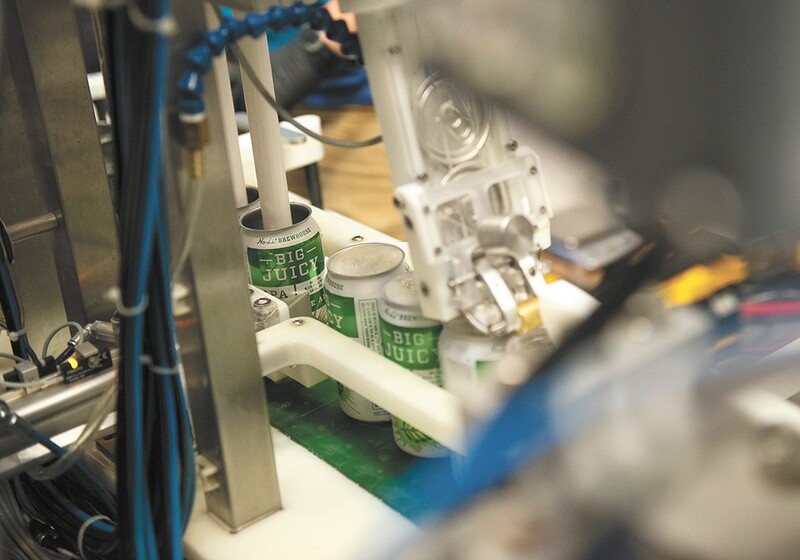 White-and-green cans labeled "Big Juicy" are coming down a conveyor belt. After flushing them with carbon dioxide, a machine fills them with beer, then spits out a cap. The cans rotate around the corner to be cleaned of excess foam and packed into six-packs. At this point, the floor around Speer is slick with a mixture of water, beer and sanitizing solution. Speer, along with her wife, Amanda Mead, are the owners of Spokes Mobile Canning, which cans beer not only for No-Li, but more than a dozen other regional breweries. Back in 2013, craft beer in Spokane was gaining popularity, and brewers would soon be looking at options for packaging their beer and distributing beyond kegs and their brewery tasting rooms. Yet most small breweries in the area didn't have the space, nor the production quantity, to justify operating their own bottling lines. Speer and Mead saw the need for a mobile canning line. At the time, there were only a handful of mobile canners in the country. These ventures hopped from brewery to brewery, helping craft brewers get their product out to the people. But nothing like it existed in the Inland Northwest. "We could see that there was something happening in this area, and it was going to be big," says Speer. Speer and Mead wanted to see more local beers on the shelves in local stores, and felt like they could get in on the ground floor. So that summer of 2013, they founded Spokes Mobile Canning. The couple pulled the trigger on the purchase of their own mobile canning line, and Speer quit her job. The line was supposed to arrive that October, but after several complications, it was continuously delayed. Cans are first flushed with carbon dioxide, then filled with beer as they move through the line. In the meantime, Speer needed to work. 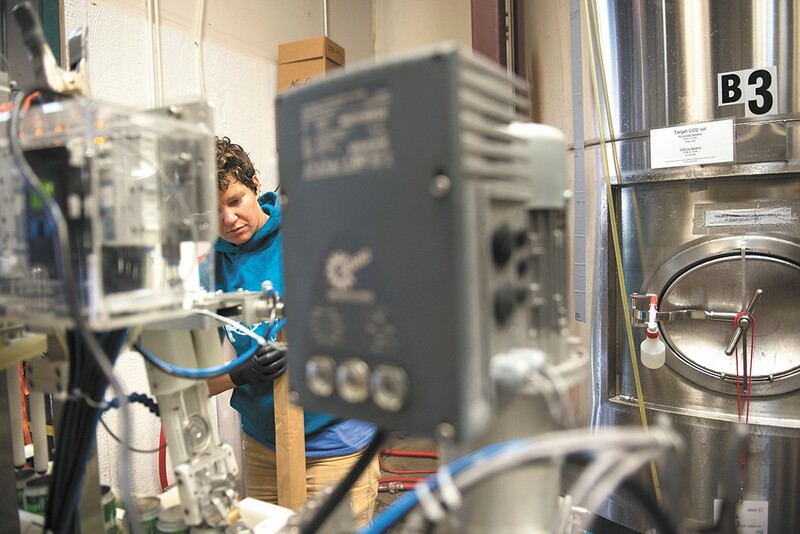 Iron Goat Brewing's Greg Brandt offered her a job at the brewery, and what started as cleaning kegs ended with her becoming an assistant brewer. Mead says that even though the delay in getting the canning line caused panic, by the time the line arrived, Speer had gained some experience in all aspects of brewing. Their equipment eventually arrived in February 2014; they canned for Orlison Brewing Co. later that month. For Speer and Mead, their job as canners is about helping the region's brewers and consumers move forward with craft beer. They say that distribution in Spokane is dominated by bottles, but they're working to change that. Cans are better for the local market, the couple says, because it's better brand security. Mead notes that if a brewery isn't packaging very often, which is common for smaller breweries, it doesn't make sense to bottle. "Bottles start losing their seal within four weeks," she says. "So if you have a beer you only package every three months because that's the speed of which they sell, the people who buy that beer three months out are getting a lesser product than the people who bought it right away." A can doesn't let in light. It has a better seal, so it doesn't let in oxygen. It preserves the quality of the beer longer than a bottle does. Isaac Joslin repairs the twist rinse, which sanitizes the cans. "If you like draft beer, you like can beer," Mead says. "It's like a mini-keg," Speer adds. Spokes has now canned for 15 breweries across the Inland Northwest, nine of which are recurring clients. No-Li is their biggest; Speer says they can about 100,000 beers per month for the east Spokane craft beer stalwart. 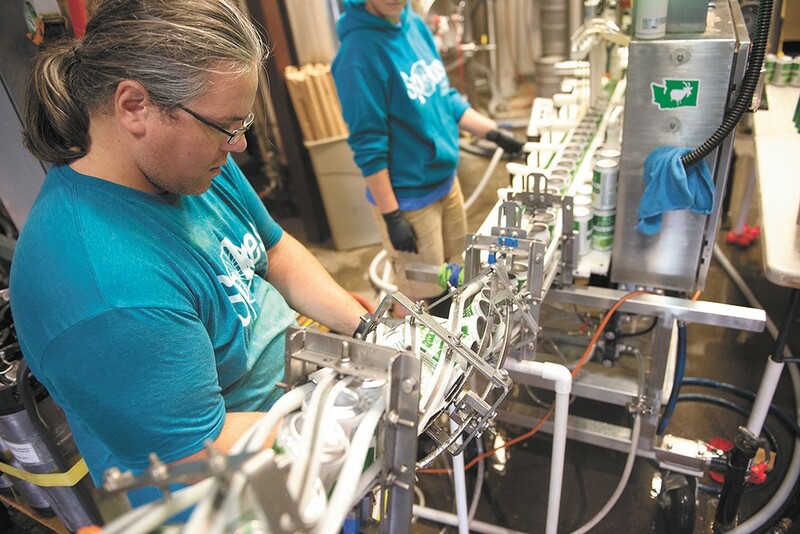 The two-woman business (they employ two other employees, one full- and the other half-time) regularly cans for breweries large and small, from Icicle Brewing in Leavenworth to Higherground Brewing Co. in Hamilton, Montana. Spokes recently helped Iron Goat put their first beer into cans. They pride themselves on being able to fit within the tightest brewing spaces across the region. The canning equipment all packs into an 18-foot trailer, and is easy to transport. The canning line itself can also be configured to allow manual feeding of the cans, which significantly helps reduce the equipment's physical footprint in a small space. "We want to serve clients who are doing 60 barrels a day, like No-Li," says Mead. "But also clients who are only going to do like 15 [barrels] once a quarter." Spokes' initial growth as a business came from clients in Montana, where the owners say the brewery scene boomed quicker than it did here. "The brewers who were canning started to edge out the ones who didn't," notes Speer. In their first few years of business, the couple also noticed that while Spokane brewers were behind the curve in the distribution of canned beer, local cideries were already using cans. The team has canned for Spokane Valley's One Tree Hard Cider, Pullman's Whiskey Barrel Cider and Chelan's Washington Gold Cider. Speer and Mead believe that Spokane still has room to grow in the brewing industry, beyond putting beer into cans. They want to see more breweries spread out across the city, but more importantly, they want greater distribution of the breweries they've come to love. "Our goal from the start has been we want to see our local beer in our local stores," Mead emphasizes.